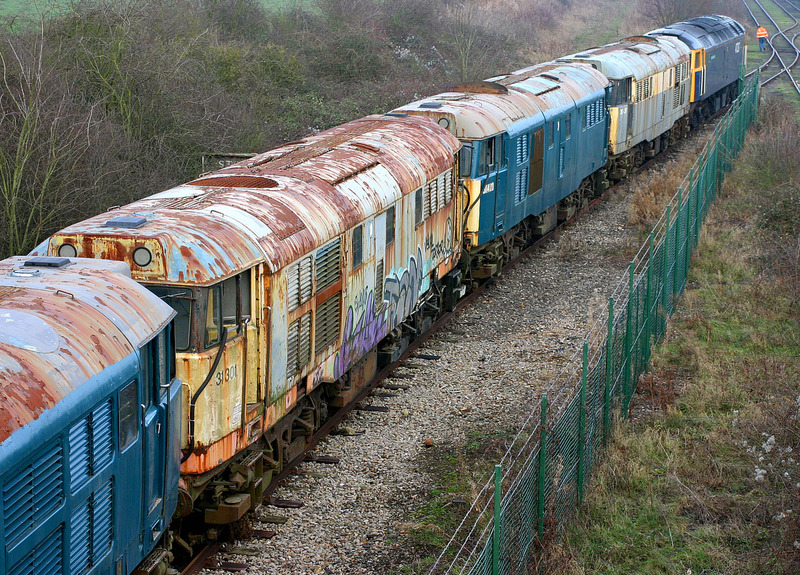 The 5Z85 10:05 Gloucester to Long Marston stock move on 19 December 2007 brought four Class 31s for storage, from their previous storage site at Meldon Quarry. 31437, 31423, 31301 & 31439 are pictured arriving at Long Marston hauled by 47237. While 31437 just looks like a normal tatty Dutch liveried 31, and both 31423 & 31439 have received a coat of blue paint (at least on the sides), 31301 is a fine example to all modellers that you can never have too much weathering! This is what nearly ten years in open storage does. Amid all the rust, graffiti and remnants of the Railfreight red stripe livery, traces of the earlier rail blue livery can also bee seen.